Well Patch Migraine & Headache Cooling Patch provides immediate cooling therapy to relieve discomfort associated with migraine, tension & sinus headaches, plus hot flashes and fevers. Drug-free and safe to use with medication, use Well Patch Migraine & Headache Cooling Patch to supplement your regular treatment routine. Each soft, flexible patch stays comfortably in place, and there is no messy or greasy residue. Convenient and portable, so it can be used at home, at work, or while traveling. Lasts for up to 12 hours. Contains: carbomer, castor oil, dihydroxyaluminum amino acetate, edetate disodium, FD&C blue no. 1, glycerin, lavandula angustifolia (lavender) oil, menthol, methyl paraben, partially neutralized polyacrylate, polyacrylic acid, polysorbate 80, propylene glycol, purified water, sodium polyacrylate, sodium polyacrylate starch, tartaric acid. SOOTHES & EASES DISCOMFORT: Well Patch Migraine & Headache Cooling Patch provides soothing relief for the discomfort of migraine, tension & sinus headaches. Also suitable for hot flashes and fevers. COOLS IMMEDIATELY: Well Patch Migraine & Headache Cooling Patch starts working the moment you put it on - cooling your forehead or neck to ease headache pain. DRUG-FREE AND SAFE TO USE WITH MEDICATION: Well Patch Migraine & Headache Cooling Patch is drug-free, so it's safe to use in conjunction with internal medications - a perfect complement to your regular treatment routine. LASTS UP TO 12 HOURS: Well Patch Migraine & Headache Cooling Patch offers lasting cooling to help soothe your headache discomfort. 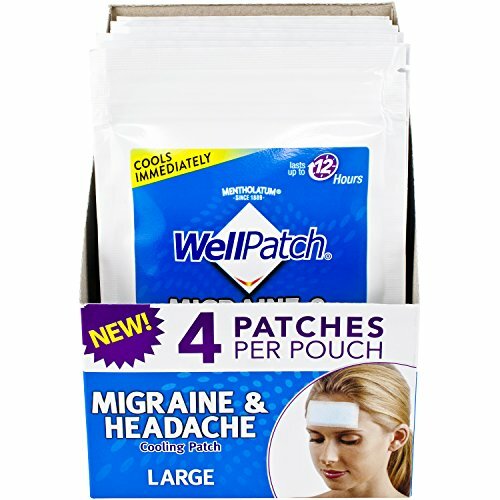 COMES IN A BUNDLE OF 16 LARGE PACTCHES: Well Patch Migraine & Headache Cooling Patch offers great value for your money. Each bundle contains 4 resealable pouches, with 4 large patches per pouch. Each patch is 4.3" x 2" (11 x 5 cm). Manufacturer: The Mentholatum Co, Inc. Publisher: The Mentholatum Co, Inc. Studio: The Mentholatum Co, Inc. If you have any questions about this product by WellPatch, contact us by completing and submitting the form below. If you are looking for a specif part number, please include it with your message.